On Saturday, November 10, 2018, we drove Washington State Route 522 over hill and over dale to Monroe. 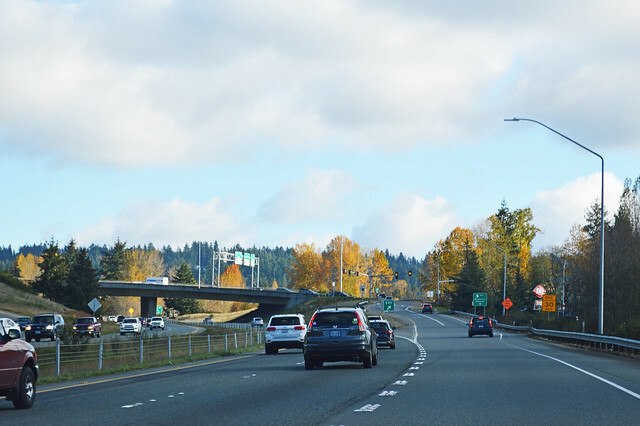 From that junction with state route number 202 near Bothell, thence northeasterly by the most feasible route to a junction with state route number 2 in the vicinity of Monroe. 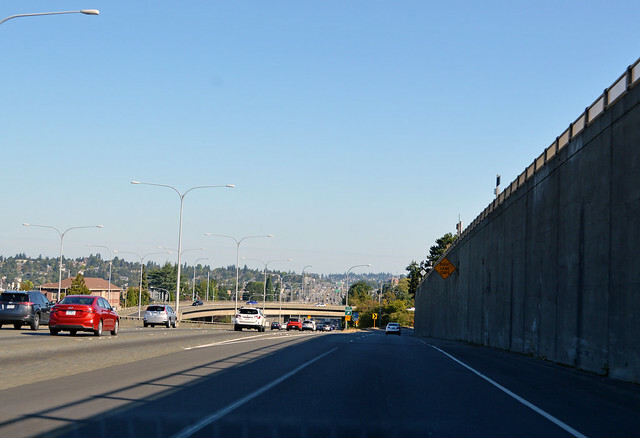 At this freeway offramp in North Seattle near Green Lake, Highway 522 departs from I-5. Primary State Highway 2 (Seattle to Spokane and Idaho) originally had two routes around Lake Washington. 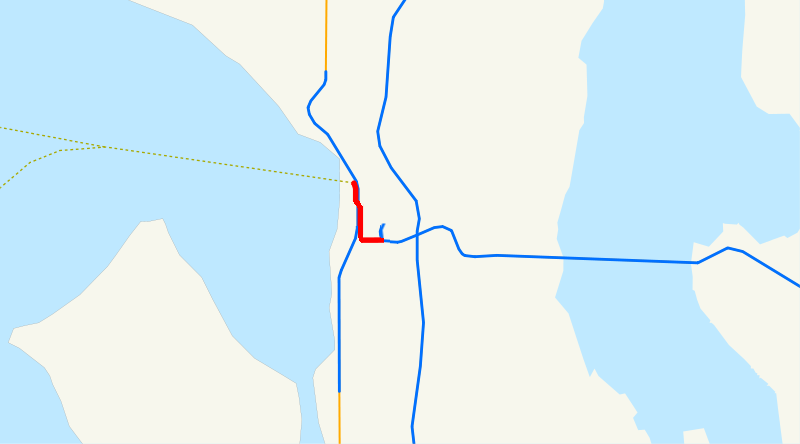 The northern Bothell branch started in downtown Seattle, went north via Eastlake and 10th and 12th, then turned slightly onto Bothell Way. After I-5 was complete, that first leg was dropped and Bothell Way was extended a short distance to this new interchange. Onward to victory! When this stretch of road was first constructed over a hundred years ago, it was called Victory Way (hence the Victory Heights neighborhood's name). It was later renamed Bothell Way, since it goes to Bothell. Then the first few miles were renamed Lake City Way, since they go to Lake City... The first stretch of Highway 522 is only 25 mph, which is new, I think. This is probably my least-driven part of this highway. But it speeds up to 35 when we leave Maple Leaf and head down the Willow Creek canyon to Lake City, whereupon we slow again. Lake City sure looks like a nice neighborhood. Another mile and we're at the junction with SR 523, aka 145th Street. We enter Lake Forest Park on Bothell Way, choose not to have barbecue for breakfast, and roll down the hill past the Sheridans to the junction with SR 104. Lake Washington appears to our right. The road turns east as we enter Kenmore. Bothell Way NE becomes NE Bothell Way. Lovely Kenmore. Sammamish River below to our right. We enter Bothell and the road turns back north. NE Bothell Way becomes Bothell Way NE. If you get off the highway here and go a hundred feet south, you'll find Red Brick Road Park, which is a stretch of the original PSH 2, paved with -- you guessed it -- red bricks. A bit north, our highway finds downtown Bothell, where we leave Bothell Way by going straight at an intersection with what used to be SR 527. It's now just a city street called Bothell Way NE. 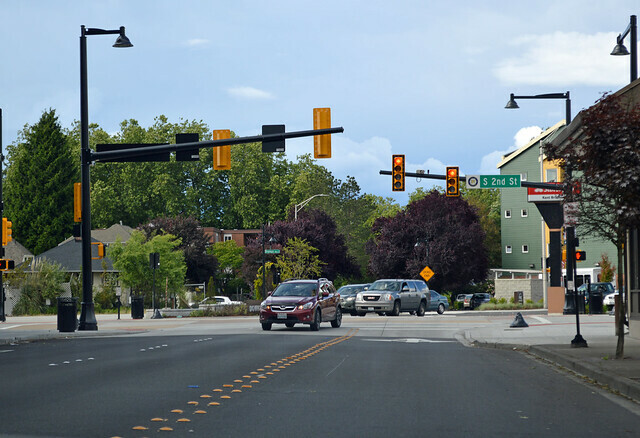 Highway 522 becomes Woodinville Drive, so let's head to Woodinville! 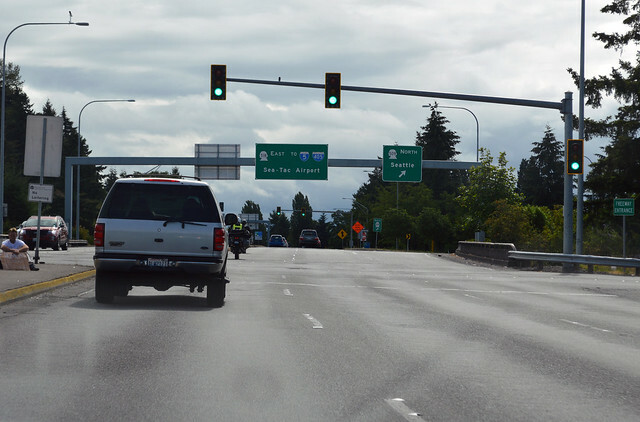 But first, the city street turns into a freeway and we have a interchange with I-405. Right about here, Highway 522 and Woodinville Drive used to cross the Sammamish River, but the highway doesn't anymore. The street name resumes across the river, however. A mile east, Highway 522 meets SR 202. Exit here if you like to sit at stoplights. Originally, Highway 522 followed the PSH 2 route to Redmond, Fall City and North Bend, while SR 202 started in Woodinville and went northeast to US 2 in Monroe. In 1970, the two were switched. SR 202 became the Woodinville to North Bend route, while Highway 522 straightened out to be generally southwest-northeast in alignment. 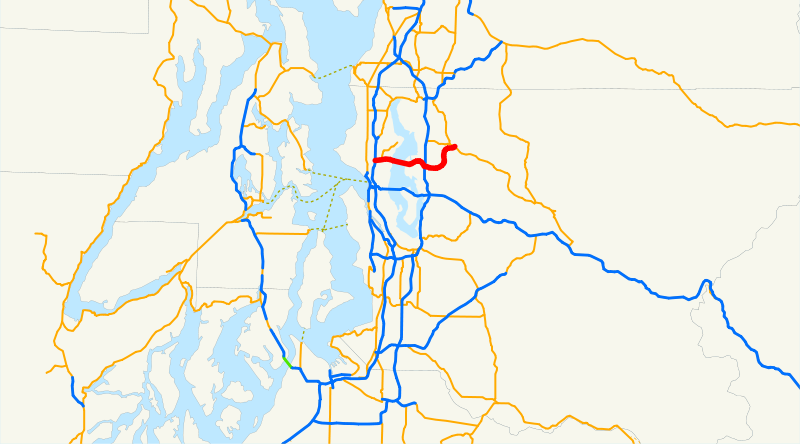 I guess that makes sense, but now SR 202 is no longer connected to its "parent" route, US 2. Highway 522 turns north to follow Little Bear Creek. The route from here to Monroe was once numbered PSH 15 Bothell-Monroe Branch. (PSH 15 was the 1930s name of Alt US 10, now US 2). 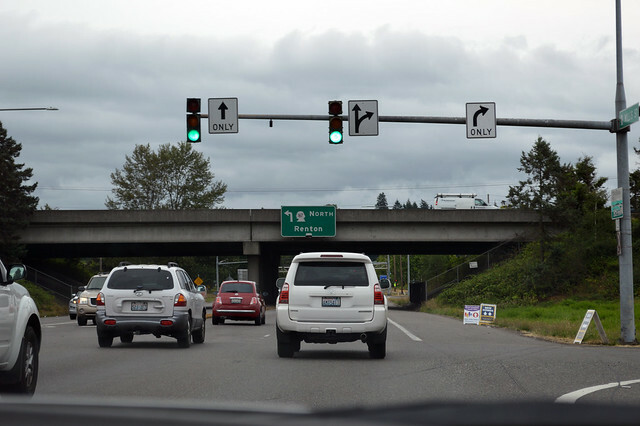 In the Snohomish County part of Woodinville, we arrive at the junction with SR 9. Arlington? Canada? Up the hill we go, turning east, then north again to Maltby. Highway 522 generally follows a Burlington-Northern spur line through here. The railroad is just to our left at this junction with SR 524. 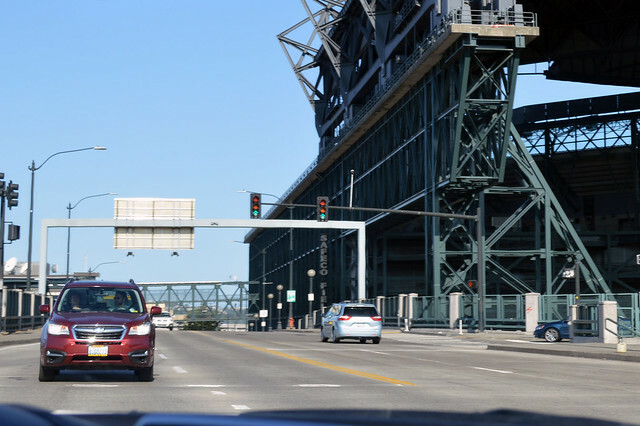 A stoplight in the middle of a 60-mph freeway? Sounds like a good idea. 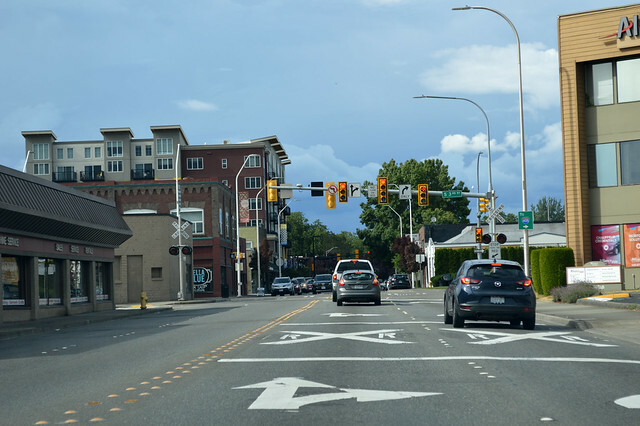 The road narrows to two lanes, but there are no more stoplights. 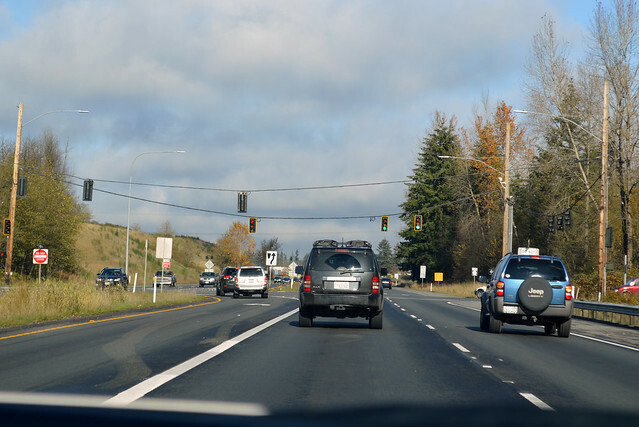 In a long line of cars, we descend eastward to the Snohomish River. Just before the bridge, the highway widens to four lanes again (construction completed in 2015). 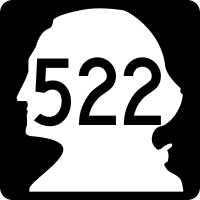 Highway 522 skirts around Bald Hill. We try to tell the high school apart from the prison. Highway 522 cuts right through the middle of Monroe, but we're so elevated that it's always out of sight. 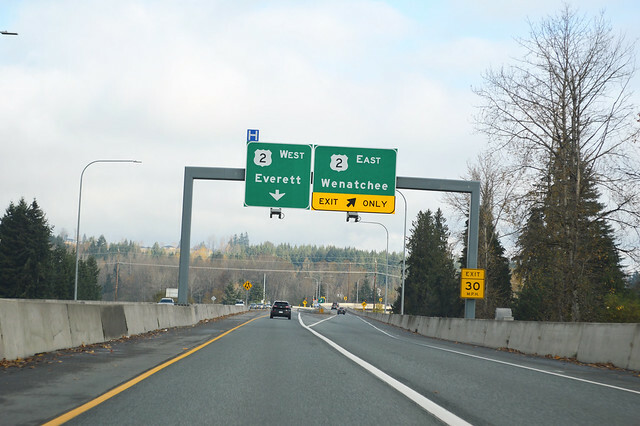 Just before the end of the highway, there's an exit for US 2 eastbound (constructed completed in 2011). But Highway 522 keeps going. We cross above US 2 and... do a 180-degree turn to an intersection with US 2, the stoplight at the end of the road. And just like the beginning, the speed limit is 25 mph. When the overpass was built, the plan was to extend another mile to a bypass highway around the north edge of Monroe. In the 1970s, the state completed the design and bought all the land for that bypass and the Highway 522 extension, but it still hasn't been built yet. The concept was last revisited in 2011, but there's no funding for construction. Finally, a green arrow! Let's go hiking -- quick, before the sun sets! On September 3, 2018, we drove across the lake and all the way to Redmond on Washington State Route 520. From northbound I-5 in Seattle, we branch eastward onto the start of Highway 520. Soon we're on a bridge (a viaduct, actually) high above Portage Bay. 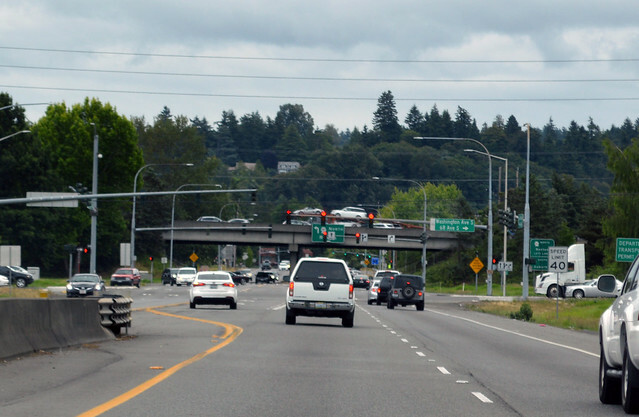 The viaduct descends rapidly toward Montlake and the junction with SR 513, which is not signed as a state highway. Last exit before toll! After the brief bit of land at Montlake, we're quickly on the Evergreen Point Bridge over Lake Washington. The first mile is a viaduct across the edge of Union Bay. 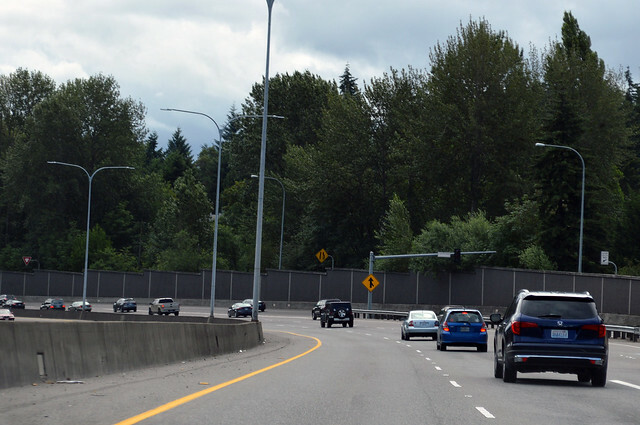 The westbound lanes were replaced in 2017, towering high above us in the old eastbound lanes from 1963. But as we climb the west highrise, we transition from the rough pavement to the smooth. We're on the new bridge, also opened in 2017. As we descend to the floating section of the bridge, the speed limit changes from 50 to 60 mph, but I think most people thought it was already 60. At the east highrise, the roadway is flanked by two columns of art. Back on land again, we are tolled a few dollars. 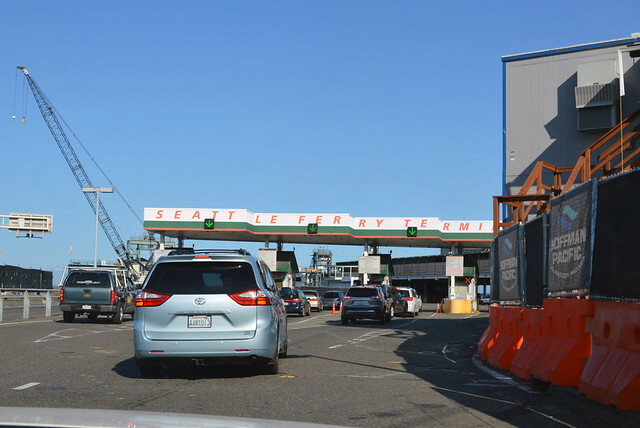 We quickly pass through Medina, Hunts Point and Yarrow Point before entering Bellevue. 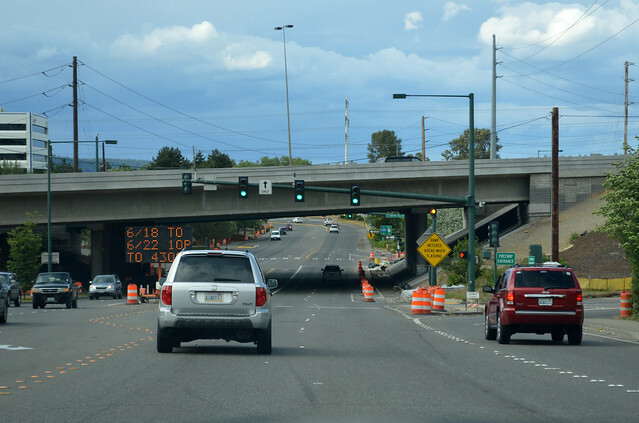 These broad, sweeping turns were widened and repaved in 2015, so we're flying when we reach the junction with I-405. We head east across the north edge of Bellevue, over and parallel to Northup Way on a section of road first built in the 1970s. We enter Redmond near the Microsoft campus and turn northward on the last section of the highway built, opened in 1979, which takes us down the hill toward downtown Redmond. 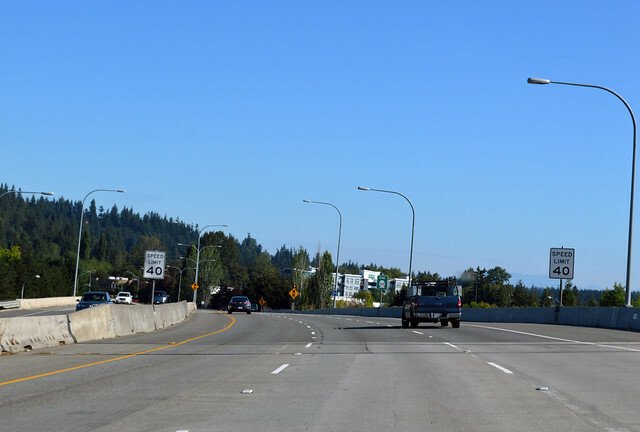 After West Lake Sammamish Parkway, we shoot straight east a mile on a section that was originally opened as SR 920 since it was completed before the preceding section. 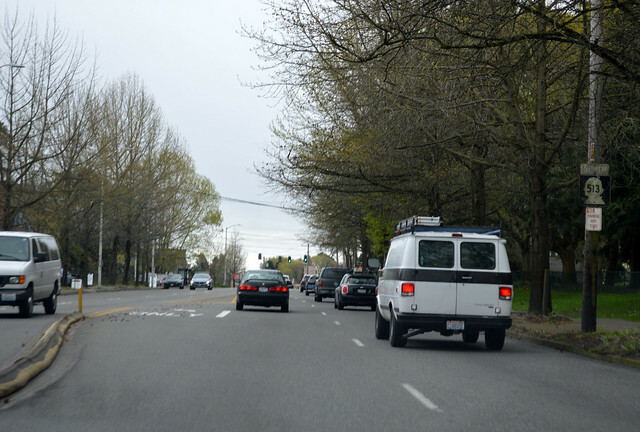 This stretch beside Marymoor Park was also only two lanes until the 1990s when it was belatedly widened and an interchange was built at the junction with SR 202. Cirque du Soleil! Highway 520 keeps going past the exit to SR 202, all the way to the end of the overpass, where "End 520" and Avondale Road begins. All I can say is that's it's much nicer to drive Hwy 520 in the light traffic on a Sunday than a weekday. On Saturday, July 7, 2018, we drove down the hill on Washington State Route 518. Beginning at a junction with state route number 509 near Sunnydale, thence easterly to a junction with state route number 5 in the vicinity of Seattle. Sunnydale is now Burien. I guess they decided "Sunnydale" was a poor name choice for the top of a hill that's usually cloudy... Highway 518 begins here at SR 509. A freeway its entire short length, Highway 518 zooms east. We enter the city of SeaTac, then pass under the three bridges built for the runway approach lights of Sea-Tac International Airport. After the exit for the airport, we pass under SR 99. 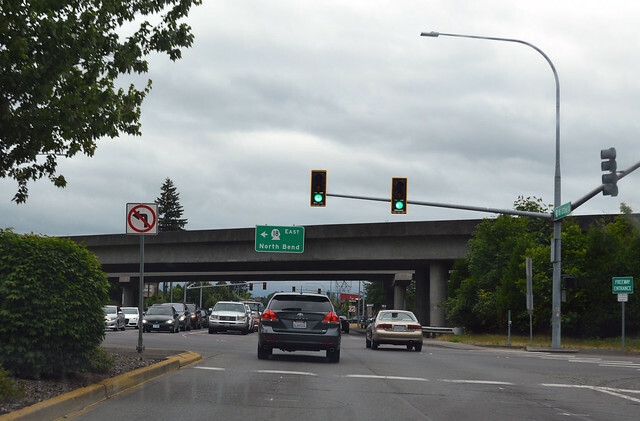 The only direct connection between the two highways is in the eastward direction, though, hence this photo of an onramp. The highway sharply heads downhill, curving down the Gilliam Creek canyon. Brakelights and sudden swerves abound as everyone jockeys for position in their correct lane: north? east? south? Welcome to the interchange with I-5. 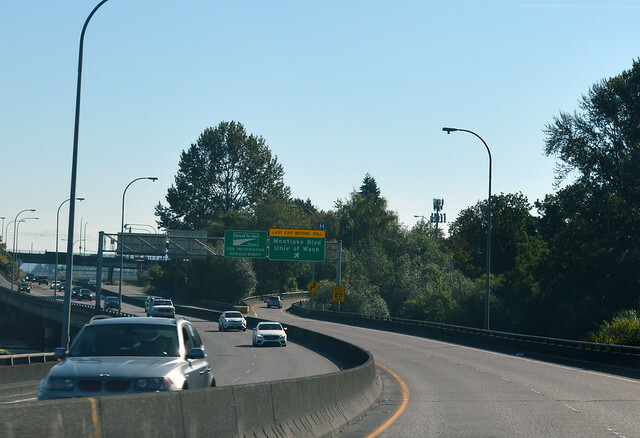 In the middle of the interchange, underneath the spaghetti bridges, Highway 518 comes to an end, replaced eastward by I-405. Well, that was pretty much as expected. Now let's go take a hike. On Saturday, June 30, 2018, we drove the length of Washington State Route 516 on the way to our birthday party! From that junction with state route number 5, thence easterly to a junction with state route number 167 in Kent, thence easterly to a junction with state route number 169 south of Maple Valley. Once what was a junction is now two highways end to end. At this stoplight in Des Moines, our street changes from SR 509 to SR 516. Highway 516 proceeds to wind up the hill away from Puget Sound, alongside Massey Creek. Shortly we arrive at SR 99 in the Midway neighborhood. In six years, there will be a light rail station a quarter mile south of here. 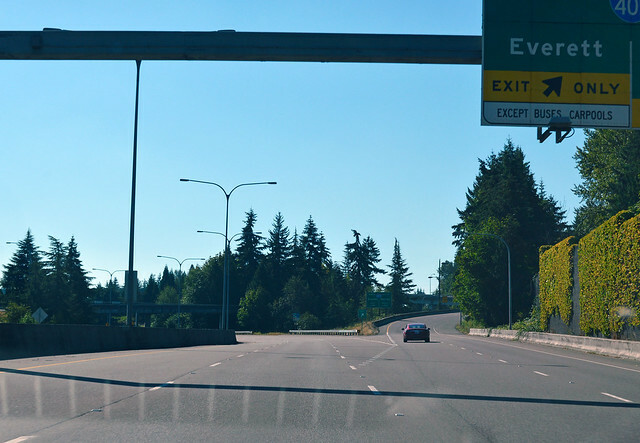 As soon as we leave the Highway 99 intersection, we arrive at the interchange for I-5. Looking at the map, you'll see that the first half of Highway 516 is the southern leg of a rough square of highways that has six parallel north-south route, but only two east-west routes. 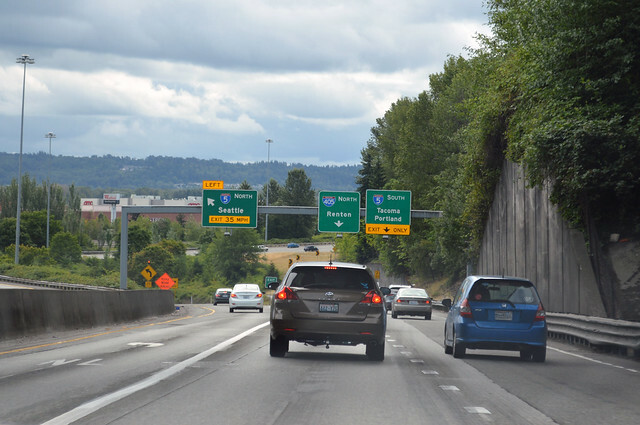 It's unusual spacing for Washington highways, but that's how the valley lies. 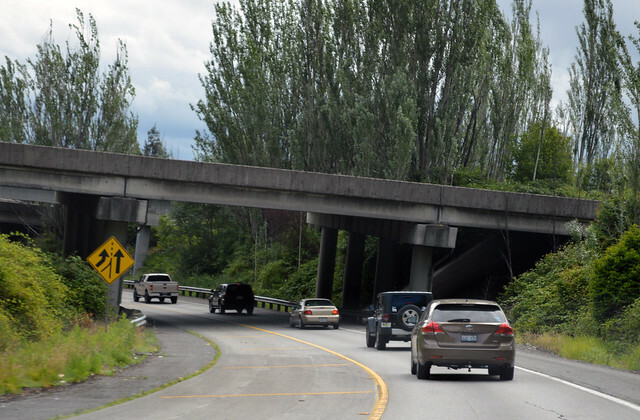 After I-5, the speed limit jumps from 35 to 55 mph, but most drivers don't seem to notice. 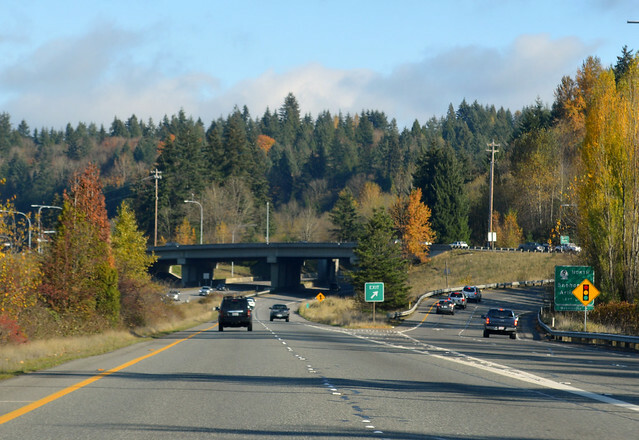 SR 516 is basically a freeway as we curve down to the Kent valley, until a stop light at the bottom of the hill (once everyone gets up to the speed limit). Then we zip eastward, cross the Green River, and arrive at the West Valley Highway, SR 181. 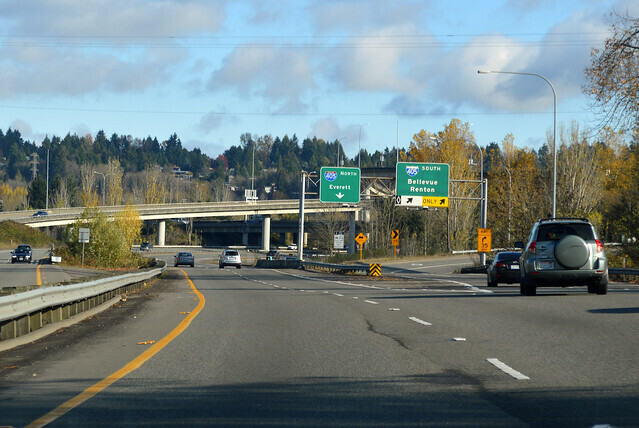 Even closer together than 99 & I-5, SR 181 is immediately followed by the Valley Freeway, SR 167. Highway 516 then slows and enters downtown Kent. With no signage (other than two left-turn lanes), we turn north on Central Ave. When we get to Smith St, there is a sign directing us to turn right. Now I'm on a familiar route, driven hundreds of times, passing Earthworks Park and heading up East Hill on Canyon Drive. At the top of the hill, we arrive at the junction with SR 515. Remember Johnny's? Eastward on Kent-Kangley Rd, the speed limit increases to 45 mph, but when we get to Meridian, nobody wants to drive that fast. 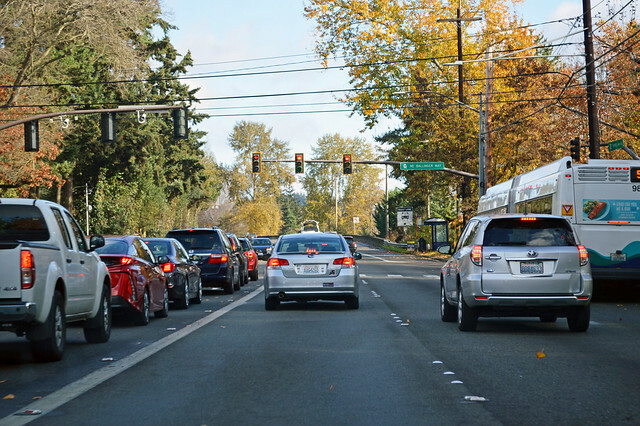 I wonder when WSDOT will reduce the speed limit down to 35 mph for the stretch around 132nd Ave. Curves -- even slight curves -- slow drivers down. We pass Lake Meridian (Remember when this was only two lanes?) and cross Soos Creek into Covington. Now the speed limit is 35, but we stop for all the lights. 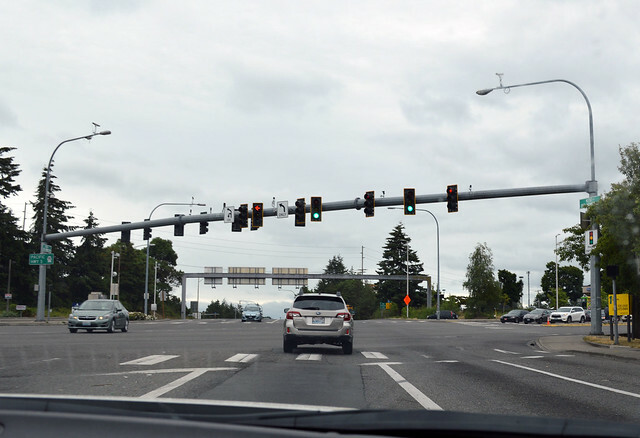 Two of the lights are for the junction with SR 18. We slowly head east through Covington, which has grown like crazy in the past thirty years. Remember Johnny's? After Wax Road, the road narrows to two lanes and we hit a traffic jam, which lasts all the way to the Home Depot entrance. 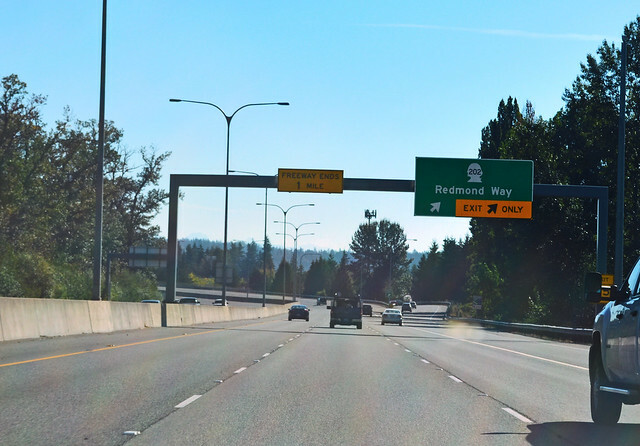 WSDOT posted a sign that they're going to widen this stretch of road ... in the future. We speed back up, cruising through the forest, gradually up a hill to Maple Valley. The city slogan should be "The Valley on a Hill", since the county didn't let them incorporate the actual valley as part of the city. The valley was left on the rural side of the urban growth boundary. Makes sense, right? At Four Corners (Summit on the old maps), we reach the end of Highway 516 at this intersection with SR 169. Kent-Kangley Rd continues onward another seven miles to the old town of Kangley and beyond, but this is the end of the state route. 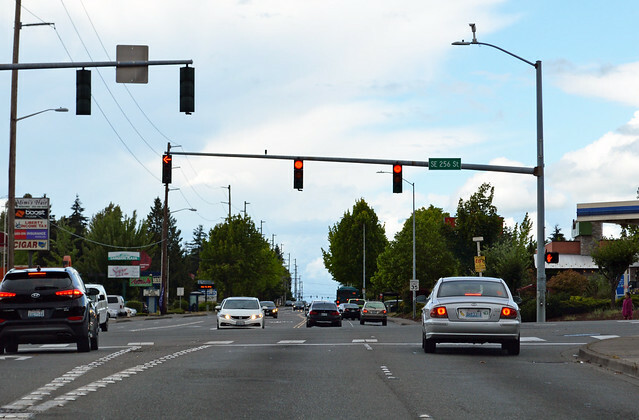 SR 516 is so familiar to me, it was surprisingly difficult to see it with new eyes and not just drive it as routine. On Sunday, June 10, 2018, we drove home on Washington State Route 515. 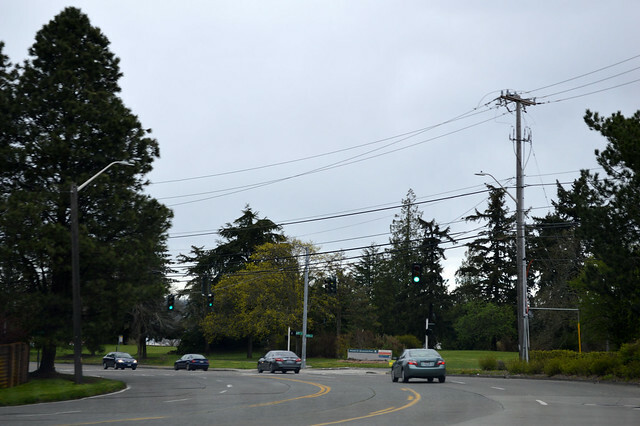 Beginning at a junction with state route number 516 in the vicinity east of Kent, thence northerly to a junction with state route number 900 in Renton. Ready for a trip down memory lane? Well, that's what Isabelle got as we drove north on the Benson Highway. 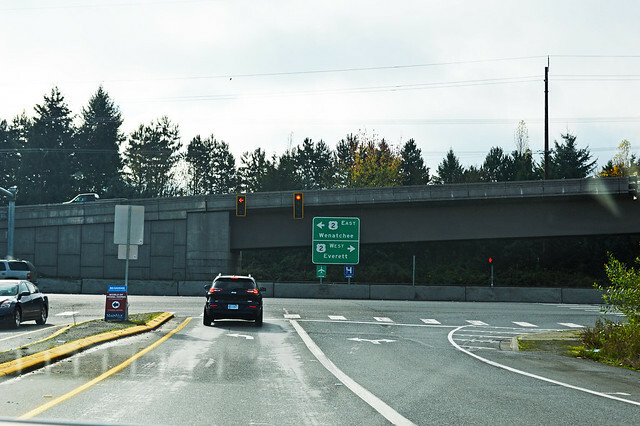 Here we begin at the junction of SR 515 with SR 516 on Kent's East Hill. "My piano teacher lived around here somewhere." "Alfy's Pizza is gone." "How long has that Red Robin been there?" "I lived on that street as a kid." "Bookworld is gone." But the Golden Steer remains. After East Hill, the highway curves away from 104th Ave SE to 108th Ave SE. "My school bus used to turn there and go past a house with a huge tractor tire in the yard and it inspired me to write a comic strip series called 'The Giant Wheel'." "I remember when this was a two-lane road." We zoom north and enter Panther Lake. "It looks like the old school is going to be replaced!" 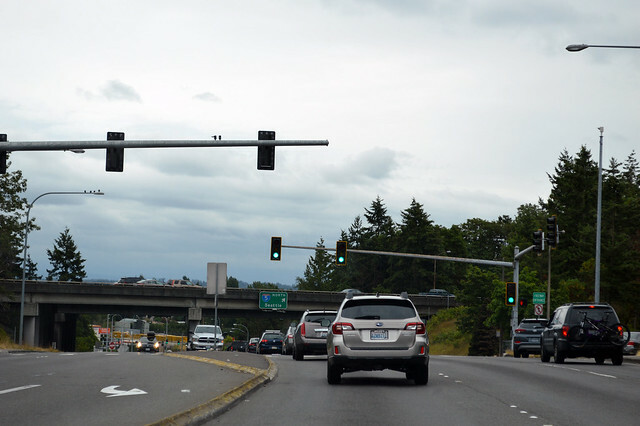 We enter Renton and Benson Hill. After Carr/Petrovitsky, the highway curves west onto Benson Drive. Take a right turn if you want to stay on Benson Road, but that's not 515 anymore. "My dentist was down that way." Also that way was the farm of brothers John and Elmer Benson, who built the road from their farm down the hill to Renton in 1913. The Benson name was carried south as the road was extended, but now it's only officially used on these two parallel streets, the original steep Benson Road and the 1970s' bypass Benson Drive, which cuts over to Talbot Road at a constant grade. 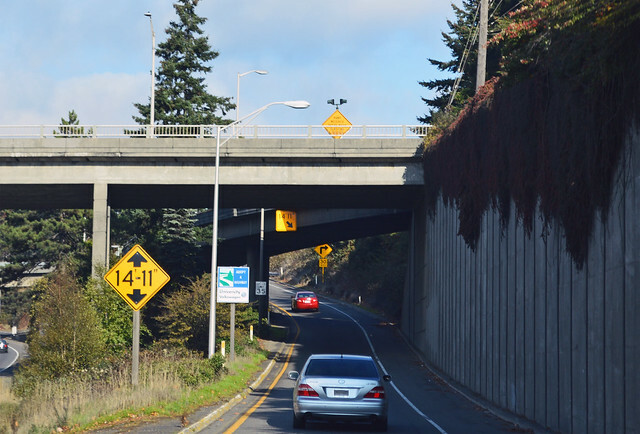 At the bottom of the hill, we reach a half interchange, built in 2010, with I-405, photographed above. 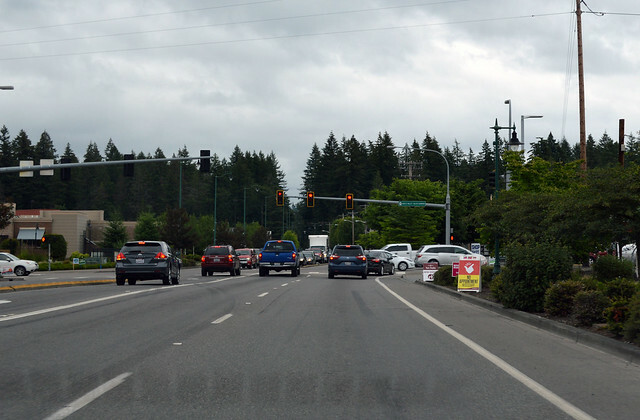 Shortly thereafter, just past Sam's Club (RIP), we turn right on Grady Way to get back to old Benson Road, which connects into Main Ave in downtown Renton. We turn left and head north into town. 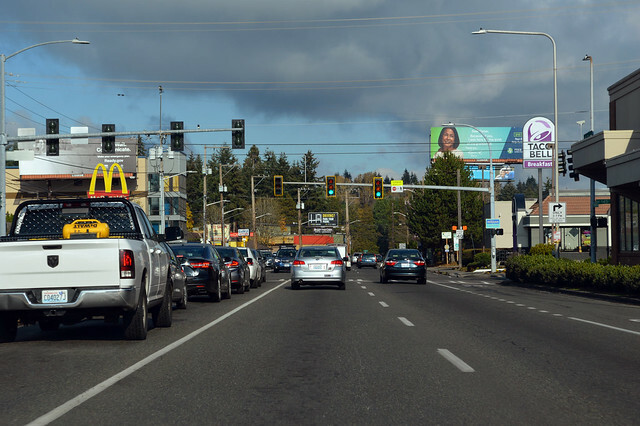 Two blocks later, though, we come to the junction with the eastbound lanes of SR 900, although the sign just says "405 thataway". 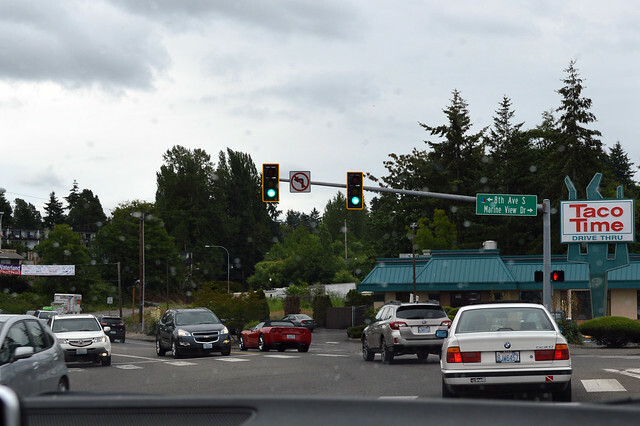 I was expecting that to be the end of our drive, but apparently last August, Renton and WSDOT changed the next block from one-way southbound SR 515 to a two-way street. So we got to drive north another block and reach the end of SR 515 at this intersection with westbound SR 900, although I didn't see any signs mentioning either state route around here. It's probably just because it was a Sunday afternoon, but that drive felt almost as fast as taking the Valley Freeway. The Benson Highway is still a highway! On Wednesday, April 11, 2018, we drove Washington State Route 513 because it was on the way. Beginning at a junction with state route number 520 in Seattle, thence northerly and easterly to the vicinity of Sand Point. Highway 513 used to start in downtown Seattle on Madison St, but that part was cut in 1971. 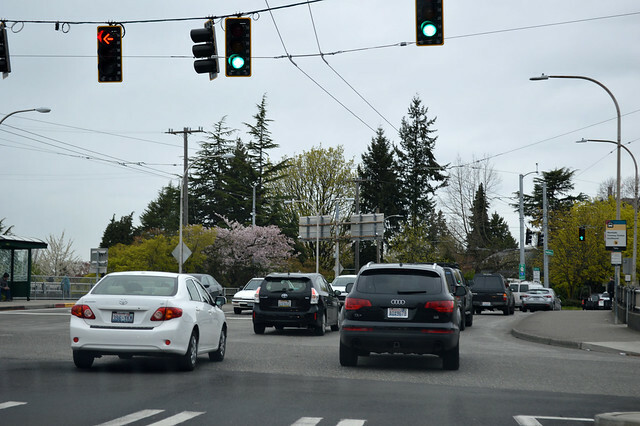 So here we begin in Montlake at this junction with SR 520. 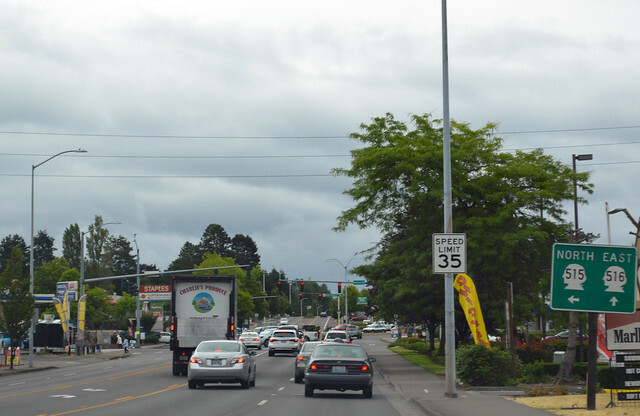 Highway 513 is not signed as a state route here; for all the world, it's just Montlake Blvd. 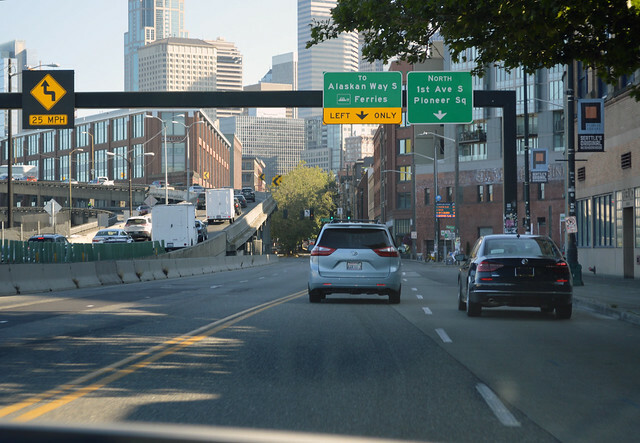 We drive over the Montlake Bridge, past Husky Stadium and curve east onto 45th St. Shortly we're at the halfway point of the route. 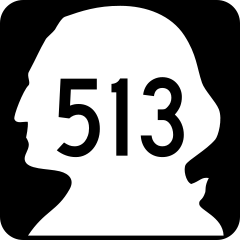 Curiously, this is also the only place with a "513" sign, hidden under the trees just past the stop light. The route curves northeast onto Sand Point Way. The speed limit increases to 40 mph and it actually looks like a state highway for a while. Soon, though, Highway 513 reaches its end at 65th St, the entrance to Magnuson Park at Sand Point. The route used to continue north then west to I-5 at 130th and 145th, but that section was cut in 1992. From what I can tell, the only reason this short stretch of street is still a state route, is because the City of Seattle doesn't want take responsibility for the Montlake Bridge. I see no other purpose for it to still be in the state's list.